Touch gestures for Wacom and Ink devices on Windows - We’ve built a powerful multitouch system to Rebelle 1.5 back in 2016 that enabled you to use two fingers for panning, zooming and simultaneously rotating the canvas. This system was built with focus on display tablets. We updated Rebelle touch system and in the new version you can use touch gestures for pan, zoom and rotate on all types of tablets without display. Fixed compatibility with Wacom touch devices on Mac OS - Wacom touch devices connected to Mac operating system did not work as expected with our touch and multitouch support. We’ve received some useful feedback from Rebelle users and were able to fix this issue with their kind help. Added ‘Enable multitouch’ option to Preferences - From Rebelle 1.5.5 you can disable all touch gestures in Rebelle on your tablet - just go to Preferences and uncheck “Enable multitouch” in Tablet options. Using two fingers for rotate, zoom and pan will not work, one-finger touch that is by default used for Blend tool will be disabled as well. Pause Diffusion bug fixed - Strange bug appeared in the old Rebelle versions - when you switched between Play and Pause diffusion, vertical and horizontal lines could appear in your previously painted stroke. This behavior is successfully fixed in this update. Minor bug fixes - Other minor bug fixes are present in the latest update so that your painting experience with Rebelle will be as smooth as possible. 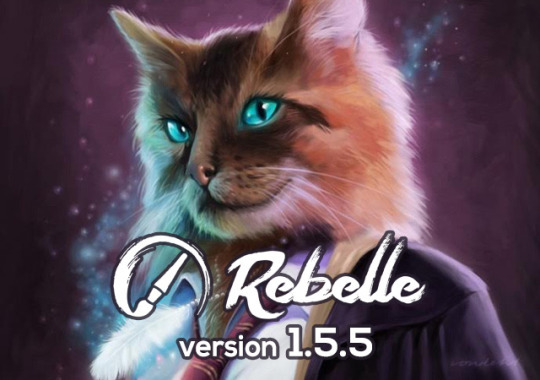 You can download Rebelle 1.5.5 directly from the application or via our Download page using your registration details. Update is free for all Rebelle users. If you encounter any bug or odd behavior, please report it either via application’s menu: “Help -> Send feedback” or by email at support@escapemotions.com along with your system specifications (OS, RAM, graphic card and processor).